TheRustedChain - The Blog: Have Mercy. A while back I introduced you to Kristen. She probably doesn't need introducing to many of you. But in case you're not familiar with her, she went on a life changing missions trip to Africa. Her own life was changed, as well as many many others. She did, she learned, she was broken. And now after months of prayer she and her family have decided to open a maternity home. "Imagine you are 13 years old, the oldest of 5 children. You live in a slum without electricty, clean water and most days, food. You watch your siblings starve. Your mother drinks to forget. Maybe she asks you to give your body to a man in exchange for food or maybe you choose to do so because you cannot bare to hear the hunger cries of your baby sister for another night. Or maybe you catch the eye of the man in the next shanty over. He rapes you in the dark alley and no one cares. *A woman is raped every 30 minutes in Kenya. Either way, you get pregnant. Your problem just got worse. You cannot continue to "work" and you cannot feed another mouth. Abortion is illegal, but you think it's your only choice. You have a backstreet abortion in the slums of Africa with a bottle of alcohol and a knitting needle. Ten days later, you die of an infection, just like *26,000 other women do every year. A loving home will offer a second chance, another option for these girls. It will be a loving, safe place for them to get prenatal care, counseling, and to have their baby. It will give their baby a chance at life, to be raised by a mother who is learning skills and self-sufficency or by a local Christian orphanage, whichever she chooses. Why a maternity home? Because it's what Jesus would do. He would simply love them." At The Rusted Chain, we've been looking for an organization to work with. And crazy as it sounds, several have said no for various reasons. Their logo is trademarked, they don't want us to use their words, etc. I understand, but we genuinely want to help! And when I asked Kristen if we could help, she immediately said yes. No hesitation, no questions asked, no fuss. 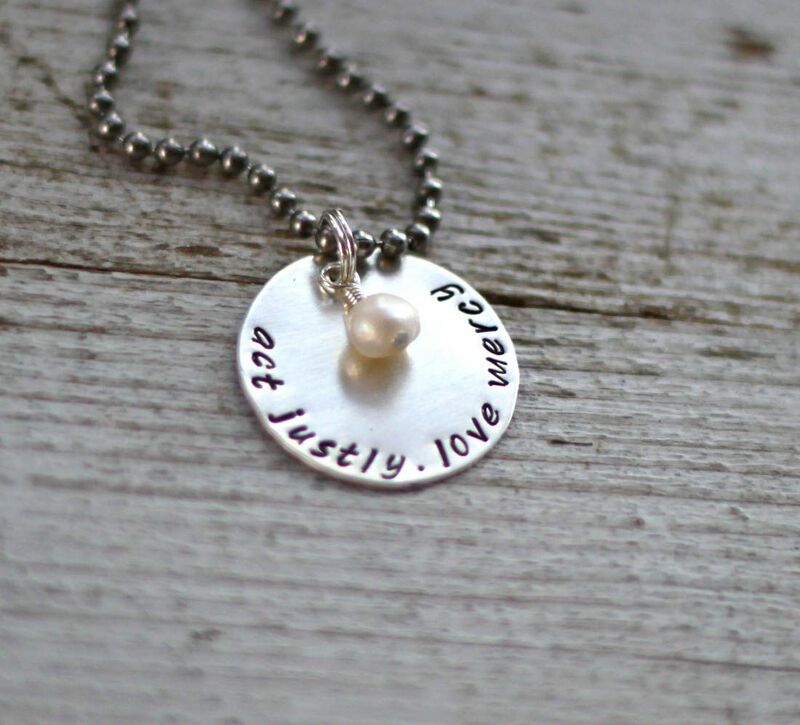 So we are now selling this Love Mercy necklace, with $10 from every one sold going directly to TheMercyHouse. I understand that not everyone will want, or be able, to buy a necklace. But even if you don't, will you pray? Pray for Kristen's family, The Mercy House, and the needs in Kenya? Beki, it's kind hearts like yours that inherit the kingdom of God. Thank you for partnering with us! What a great idea for a maternity home! Great partnership and beautiful necklace. Will definitely be praying (and adding to my TRC wish list!). :) Blessings to you all! I have a friend, who may be able to help with info. She works for a non-profit who helps with maternal care in 3rd world countries. She may have connections your friend could use. They distribute meds and pills...that cost like 30 cents a day...and saves the lives of many mothers. Our heavenly Father will bless you and your ministry, Kristen, through The Rusted Chain and elsewhere. Just wait and see his mercies. wow, what an amazing cause. I will keep Kristen and her family in my prayers and get a necklace, too. What a nice gift idea. Beki, that scripture from Micah is so fitting. Amazing things happen when we tear down the walls and let our hearts be broken so that God can offer us a plan to put them back together and make a difference. What a lovely thing Kristen and her family are doing...and what a lovely way to help them! What a beautiful necklace. I know this one is on my list to buy. fantastic idea! such an amazing vision to help those in desperate need - this touches my heart! The story gave me chills. Unimaginable. What a wonderful gesture and an amazing necklace!! !